The back can be a hotspot for pain. In fact, back pain is the leading cause of disability in adults under age 45. Back pain can be chronic or acute, and it can result from numerous causes such as accidents/injuries, arthritis, sprains and strains, fractures, poor posture, wearing high heels, and stress. 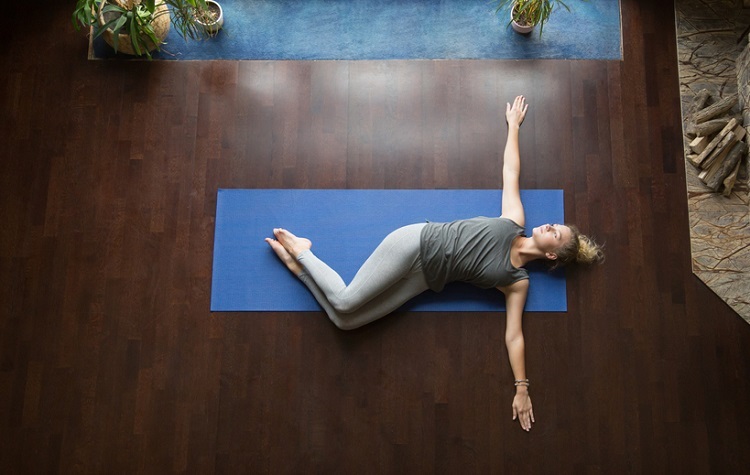 If you've seen a doctor and he or she gives the go-ahead, consider trying these yoga poses known to relieve back pain! These moves are all simple enough for even someone who has never tried yoga before. Make sure that you move slowly and breathe for each move. All you need are some comfortable, stretchy clothes and a yoga mat. This pose will elongate and align your spine while relieving tension. Kneel on your matt, keeping your knees hip-width apart, feet together behind you. Breathe in, and as you exhale, drape your torso over your thighs, resting your forehead on the floor. Your arms should be long and extended with palms facing down. Ease further into the stretch by pressing your buttocks back towards your heels while elongating from your hips all the way to your fingertips. Hold for one minute while breathing deeply. Cobra pose will help stretch, elongate, and strengthen your spine. This is a great pose if you suffer from poor posture. Lie face-down on your mat with your forehead resting on the floor. Your hands should be pressed palm-down by your armpits, slightly lower than your shoulders. Keeping your elbows close to your body and pointing behind you, press into the floor with both hands. Pull your shoulders back and keep your hipbones on the ground as you straighten your arms, pushing yourself into an arched position. The tops of your toes should remain flat on the floor. Tilt your chin up as you expand your chest, gazing upwards. Stay in this position for a few deep breaths before lowering back to starting position. This position will stretch your lower back, hips, shoulders, chest, and upper back. Lie comfortably on your back with your knees bent in towards the chest and arms extended outward like the letter T, palms facing up. Inhale, and as you breathe out, drop your knees to the right while gazing towards the left. Take a few deep breaths before returning to center. Next, drop your knees to the left while gazing toward the right. Again, take a few deep breaths in and out, feeling the stretch, before returning to your starting position. Downward facing dog is a well-known yoga pose will stretch your hamstring and calves along with your shoulders and spine. Because it is a mild inversion pose, check with your doctor before doing it if you are pregnant. Start on your hands and knees, with knees in line with your hips and your wrists directly under your shoulders. Your fingers should point towards the top of your mat. Take a deep breath in, and exhale as you tuck your toes under as you lift your knees and straighten (but do not lock) your legs. Your elbows should also be straightened, and your body should form an A shape. Lift through your pelvis, imagining that your thighs are being pulled backward. Inhale and exhale deeply as you feel your spine lengthening with your sit bones stretching up to the ceiling while pressing your hands and feet into the ground. Hold for 30 seconds before releasing and returning to start. Learn how to relive your migraines with our migraine relieve tips. Guide on how to relieve migraines! Pregnancy isn't the only cause behind missed periods. Click here to learn about five other reasons you may miss your period, and what you should do about it!